HALL, JAMES, arctic pilot and navigator, participated in three expeditions to Greenland in Danish service and led a fourth expedition in English service; d. 1612 and buried in Greenland. 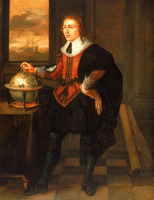 The results of John Davis’s explorations had excited the interest of Christian IV of Denmark, who determined to re-establish communication with the Scandinavian colonies known to have existed formerly in Greenland. In 1605 he sent out an expedition of three ships under John Cunningham. Hall – a native of Hull about whose personal history nothing is known – served as first mate and pilot. Hall probably had accompanied one of the Davis voyages. John Knight, a captain in the fleet, may also have had experience in arctic navigation. The expedition made landings at King Christian’s Fjord and at other parts of the west coast. They saw nothing of the lost colonists, but they took captive some Eskimos and collected some ore that they wrongly thought was silver-bearing. In 1606 the king sent out a five-ship expedition to Greenland in which Hall again served as pilot and first mate to the commander, to continue mineralogical exploration in the same area. Ice and currents in Davis Strait forced the ships westward until they had reached about 66°N when an opportunity came to sail eastward to the Greenland coast. While on the western side of Davis Strait they sighted Baffin Island but made no landing. They brought back more ore that proved worthless and more Eskimo captives. In 1607 Hall accompanied a third royal expedition of two vessels, which ended in failure, for the ships were prevented by ice from reaching Greenland. In 1612, having returned to England, Hall persuaded four merchants of London to join him in financing an expedition to Greenland for the purposes of mineralogical exploration and trade. He sailed with the Patience and Heart’s Ease to Cape Farewell and followed the west coast of Greenland north. On 22 July in Rammel’s (Amerdlok) Fjord, Hall was evidently recognized by a group of Eskimos from whom he had earlier taken captives. One of them struck him in the side with a spear, and he died the next day. According to his last wish he was buried on a nearby island rather than at sea. Hall’s fourth expedition provided William Baffin, who probably sailed as pilot in the Patience, with his first arctic experience. Baffin’s geological observations were the most important result of the expedition. Hall’s report to the King of Denmark on the voyage of 1605 was accompanied by four maps, results of the earliest attempt to map the west coast of Greenland. This report and others published by Purchas formed a valuable source of knowledge about Greenland which England used to greater advantage than did Denmark. Danish arctic expeditions (Gosch), I, includes narratives of Hall and his contemporaries. DNB. Dodge, Northwest by sea. Vilhjalmur Stefansson, Greenland (London, 1943). Alan Cooke, “HALL, JAMES,” in Dictionary of Canadian Biography, vol. 1, University of Toronto/Université Laval, 2003–, accessed April 24, 2019, http://www.biographi.ca/en/bio/hall_james_1E.html.